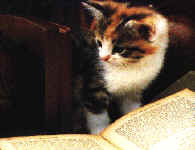 Animals In Print is an animal rights organization dedicated to educating others about cruelty towards animals. Animals In Print provides a free online newsletter for responsible and effective animal rights advocacy. Founded in September of 1997, we exist to educate and motivate you to do all within your power to end animal abuse and spread compassion. We support and encourage cruelty-free living ( i.e. ; not eating, wearing or using animals or animal byproducts). We do this in an attempt to lessen the intense miseries, cruelties, torture and deaths billions of other non human animals needlessly suffer at the hands of humans every year (i.e., "factory farming", trapping, hunting, maiming - debeaking and castration without anesthesia, electrocution, death by suffocation, life in solitary confinement, death by drowning, neglect, force-feeding, etc.). We wholeheartedly support choosing a vegan lifestyle; using no animal products; eating a healthy diet free from animals and animal products; using everyday household products that do not contain animal byproducts and which are not tested on animals; and spaying and neutering all companion animals. We encourage exploring a vegan diet for your companion animals as well (instead of feeding them the brand-name slaughterhouse byproduct pet foods that dominate the market. And we urge support for the efforts of The Animal Liberation Front and The Animal Liberation Frontline. We have no affiliation with any religious, racial or political organizations and respect all individuals. To sign up for our free online newsletter, send an email to [email protected]. There is no expressed or implied endorsement by Animals In Print staff of articles, stories, petitions or reported activities.